My affinity for early Twentieth Century U.S. Navy Uniforms, especially those from the enlisted ranks, is increasing even if I am financially restrained from pursuing my most desired pieces when they surface onto the market. On some rare occasions, an artifact that I would love to add to my collection is listed and flies beneath the radar of fellow collectors leaving me the opportunity and wherewithal to bring it home. I have written several articles (including considerable research for each) related to elements of uniforms from the first few decades of the last century ranging from rating badges, enlisted jumpers and head coverings and yet there is much that I am still discovering. The overwhelming focus of this site has been directed at naval artifacts and my collection is heavily weighted with U.S. Navy artifacts however I cannot consider myself to be an expert in these areas. One item of the enlisted naval uniform that I have much to learn about is surrounding the dress blue cap, known by many as the “Donald Duck Hat” or simply, the flat hat. To delve into the full history of enlisted headwear and the entire life of the dress blue cap, I would need to write a multipart series of articles in order to give the hat its proper due (perhaps that will be a future project?). For the purposes of this post and to reflect the pieces that I have in my own collection, this article will be constrained with a narrow and specific focus. Though flat hats were an integral part of the enlisted naval uniform for well over a century, it has been more than a half-century since the Navy retired them from usage. The earliest references to the flat caps were seen in the Navy Uniform Regulations of 1833 as the Navy began to standardize wear for seaman and petty officers. This wide-brimmed black hat was worn by enlisted sailors many years ago when the Navy first began. Painted with tar, the wide brim kept sun off a sailor’s face (source: Naval History and Heritage Command). ART. 601. The outside dress clothing of the petty officers, seamen, ordinary seamen, landsmen, and boys, shall consist of blue cloth jackets and trowsers (sic), blue vest, blue cloth cap or black hat, black handkerchief, and shoes, when the weather is cold; when the weather is warm, it shall consist of white frock and trowsers, black or white hats, or blue cloth caps, as the commander may direct, having regard to the convenience and comfort of the crew, black handkerchiefs and shoes. In the 1833 regulation, there is no specific mention of “flat hat” as the term itself wasn’t part of the vernacular in use regarding the headwear at the time. Of the two references (in bold) referring to blue or black headwear, the cloth cap is the early example of what we know today as the flat hat. “Black hat” is referencing the various broad brimmed black tarpaulin headwear that were worn for several decades by enlisted sailors in the mid-to-late 1800s. These are actually (sennit) straw hats that were coated with tar that provided the sailor with a waterproof head covering that could withstand the rigors of shipboard life. The caps were adorned with a ribbon that was the forerunner of the hat talley that would be seen on the flat hats. The hat band/ribbon has separated and a temporary attachment is holding it in place on the hat (source: Heritage Auctions). A pre-Civil War enlisted seaman’s sennit (straw hat) with ribbon. Note the hand-embroidered pattern on the crown and the hat band ribbon (source: Heritage Auctions). Showing the underside of the pre-Civil War era sennit and the hand-embroidered adornment at the hat’s crown (source: Heritage Auctions). As the uniforms evolved with technology, the hats advanced. Painting straw hats with tar began give way to new methods for waterproofing such as creating a tarpaulin cover. Further advancements that helped in the reduction uniform expenditures and conserving the very limited space aboard ship but allowing sailors to have a single hat instead by making the hat convertible from a standard sennit to a waterproof one. by fitting the hat with a two-piece cover fabricated from oilskin or oilcloth fabric provides the desired effect. A naval enlisted “sennit” hat was fit with an oilcloth rain cover allowing the hat to be lightweight for warm dry weather or waterproof as needed. (source: Heritage Auctions). A naval enlisted “sennit” hat with the top piece of the oilcloth cover removed (source: Heritage Auctions). The removable oilcloth cover – Civil War era enlisted straw hat (source: Heritage Auctions). Aside from the black (flat straw) hats, sailors also began wearing blue cloth cap that was the forerunner of what was later known as the dress blue hat for enlisted personnel. By the time the American Civil War began, the blue cloth caps were the most commonly worn hats by petty officers and seaman. The long ribbons that encircled the black hats were transitioned to shortened (without the extended streaming tails) versions and some were adorned with the name of the sailor’s ship name (sans “U.S.S.”) added by hand using gold paint. Late in the Civil War, there were some instances of entire crews having their talley’s embroidered (with gold bullion) in lieu of the painted vessel names. The gold wire-bullion embroidery became common (though still not standardized) with for flat hats in the 1883 naval uniform regulations. Another aspect of the blue caps was that they were soft and formless leaving sailors to customize their caps to suit their individual style by adding stiffeners or filling (almost pillow-like) to give them a personalized shape. In 1866, the black hat tarpaulin hats were no longer used. Seaman Ebenezer McKay dons his blue cloth cap for this photo taken between 1862-63 (Library of Congress). This sailor’s uniform shows the button front of his bell bottom dress blues and his blue cloth cap (Library of Congress). An unidentified U.S. Navy sailor wears his blue cloth cap (flat hat) cocked to starboard (Library of Congress). As the American Navy was advancing from wooden hulls and sail to ships made of steel and powered by steam, the uniforms worn by crews changed with their needs. Changes to the dress blue hat were made in 1883 that remained, keeping the flat hat’s appearance consistent for the next 40 years. The U.S. Navy didn’t have the uniform supply system in place that exists today (which truly came into being as World War II was looming on the horizon in 1940) leaving sailors subject to acquiring or even making various uniform components. Flat hats conformed to a regulation standard but would vary in the diameter of the top (9 to 11 inches) which differed as it conformed to the size of the sailor’s head. Dress blue hats included a broad leather sweatband that is seldom visible in surviving caps due to the cotton shirt lining that has been sewn in for both comfort and to conceal the damage to the cowhide (due to sweat and repeated, prolonged usage). This photo, taken aboard the USS Ossipe, a wooden hull, screw sloop of war in 1887 shows the cooks on the birth deck (Naval History and Heritage Command). These USS Enterprise (a barque-rigged screw sloop) apprentices are posing for this 1890 photo on deck. Take note of the very broad diameter of some of the flat hats worn by these sailors (Naval History and Heritage Command). This late 1890s photos shows two sailors from the USS Maine. Note the thickness of the flat portion of the hat and the difference in the diameter as the sailors’ heads are clearly different sizes ((Naval History and Heritage Command). Gunner’s Mate 3rd Class Clautier is ready and armed for guard duty on USS O-7’s (SS-68) deck, circa 1918-1919 (Naval History and Heritage Command). Though heavily worn, the embroidery on this USS Newark (C-1) is nothing short of stunning though the hat could not have been worn aboard ship or while on duty (Source: eBay image). In the years leading up to the Great War, the flat hats became more standardized with cotton linings being sewn in at the manufacturers, effectively eliminating the variations of various printed patterns on the linings for subsequent caps. Still, sailors would either heavily customize their caps with almost gaudy embroidery and fancy needlework (typically on the crown) however such embellishments were unauthorized for wear aboard ship. Caps with these decorations were worn ashore and during liberty or leave periods. Though modern Navy regulations have all but eliminated the personalization of uniforms, sailors have always found a way to add their own custom touches over the last century and a half. Flat hats with such personal flair are exceedingly scarce and never fail to draw the interest of collectors. Although they might appear to be, tally ribbons were never tied to flat hats. A closer examination of the ribbons reveal that the ribbon was wrapped around the outside of the cap (even with the sweatband), trimmed and the ends tucked beneath the bow that was already secured to the cap with a stitch. Once secured beneath the bow ribbon would be stitched around the circumference of the hat. The tally of this USS Newark flat hat has multiple rows of stitching affixing it to the hat. The fine gold bullion lettering is flatter than many other examples of this era (early 1900s) and is showing age (source: eBay image). The cotton lining has deteriorated considerably showing the original sweatband of the USS Newark (C-1) flat hat (Source: eBay image). The USS Newark (C-1) dress blue cap: showing some moth holes and the multiple lines of stitching on the tally (Source: eBay image). A close-up of the USS Newark (C-1) tally and the stitching that attaches it to the hat. Moths have nipped away where the top is mated to the head band. Note the gold stitching of the ship name (Source: eBay image). The USS Tacoma (CL-20) broke apart on Blanquilla Reef near Veracruz, Mexico in 1924. This heavily faded flat hat features custom embroidery on the crown and is missing the stiffener. The extra stitching on the tally could indicate that there are multiple tallies from the owners previous shipboard assignments (source: eBay image). Embroidery on the top of the USS Tacoma flat hat. This cap is severely faded (source: eBay image). Showing the custom fitted interior lining made from a silky material. This hat also features a drawstring at the linings opening allowing it to be tightened around the sailors head (source: eBay image). Viewing the exterior of this USS Buffalo flat hat, it appears to be a quite normal, pre-WWI example. The interior shows the caps true beauty (source: eBay image). The USS Buffalo flat hat lining is a work of art with the custom tasseled drawstring and rich purple silk material (source: eBay image). This flat hat has the post-1940 “U.S. Navy” tally. This flat hat is of the 1933 pattern but was issued during WWII. In 1933, the design of the flat hats changed once again with more standardizing in the shape and materials of the hat. Gone from the flat hats were the broad, head-size dependent thin and very flat top along with the printed cotton fabric lining. Also, the rigid hat stiffeners were changed leaving a more slouchy, beret-like appearance. The design gave the hat a pronounced for and aft appearance with the front portion of the top rising upwards, seemingly drawing more attention to the tally. The tallies also experienced a material change from the gold bullion wire ship and command names in favor of a gold colored thread, producing a low-profile lettering across the face of the talley that did not discolor with tarnish or verdigris. By 1940, the U.S. was rapidly growing its forces and building ships in an effort to catch up to the immense threat that was spreading in Europe and the Pacific. Ships of all classes were under construction in shipards up and down both coasts. To reduce the difficulties in managing ship identifyers for enlisted caps for each existing, under construction and planned naval vessel, the decision was made to eliminate the ship names from tallies and replace them with “U.S. Navy.” It has been suggested that this change was done as a security measure surrounding ship-movement but the notion that the presence of uniformed sailors in a port would be more obvious than the large battleships or aircraft carries is somewhat ridiculous. One of my most recent flat hat acquisitions was one that I happened upon a few hours before the online auction listing was set to close. The dress blue cap was one that fit perfectly within my Navy collecting focus (see: Focused on Niche Areas of Collecting: USS Washington). The flat hat, a post-1933 design included a tally that indicated it was from the USS Seattle and yet there are a few questions regarding the hat design and tally combination. To help illustrate these questions, I have summarized the timeline of the ship below. A flat hat from the USS Seattle, the former armored cruiser USS Washington, that dates from the interwar period of 1933-1940 (Source: eBay image). The tally of the USS Seattle flat hat shows some wear but is in good condition, overall (Source: eBay image). USS Seattle’s reclassification from a combatant ship (a heavy cruiser) to a receiving ship transformed her role in regards to crew assignments. The mission of a receiving ship is two-fold: to serve as a location to receive newly inducted recruits as their personnel records are established, they are issued uniforms and initial training is conducted before they are sent on for to complete training and assignment to their permanent command. The other role of a receiving ship is to serve as a location for sailors who are nearing the end of their enlistments to be processed out of the naval service, having been transferred from their commands to await discharge. Receiving ships also served as locations for judicial proceedings such as courts martials. Sailors who were processing in would have most likely been issued dress blue caps with a generic “U.S. Navy” tally to be worn until they reached their permanent duty station. Depending upon the time that it takes to outprocess, sailors awaiting discharge would have worn the tally of their last command. Stenciled to the back of the leather sweatband of the USS Seattle flat hat is the sailors name: Feldt (Source: eBay image). In attempting to determine the age of the cap and tally, it could only be pinpointed a range of years between 1933 and 1940 due to the time-period for the pattern of the hat (1933-1963) and the elimination of ship names from cap tallies. With some researching of the sailor’s name (“FELDT”) stenciled to the backside of the leather sweatband, the date range could be narrowed down by searching the ship’s muster rolls. It is most-likely that Feldt was part of the crew of the Seattle responsible for the in and out processing of the transient sailors that were temporarily assigned to the ship. On April 1, 1963, the Navy unceremoniously brought about the end of the the dress blue cap, having been relegated to an item that sailors stuffed into their seabags, seldom seeing wear since being issued at bootcamp. Since the World War II, the white hat (lovingly referred to as the “Dixie Cup”) was popularized due to its ease of wear and that it could be rolled up and stowed into the back of the trousers, concealed beneath the jumper when in doors and not in use. With the vast numbers of wartime films depicting sailors in their dress whites and blues wearing their white hats cocked forward, aft or to the side, rolled edges, or hand-formed to a number or shapes, the versatility of the white hat (worn with all of the enlisted uniforms while the flat hat was only worn with dress and undress blues) drove the dress blue cap out of use. So many of the caps were made during WWII that the Navy supply system was still issuing them into the early 1960s. Here’s an Idea…Visit a Memorial or Monument for Memorial Day This Year! Historically, when I wrote an article regarding Memorial Day, I would publish it during that weekend or as close to the actual day as possible. I chose to take a slightly different approach with today’s post as I am hopeful that I can perhaps influence one or more readers to depart from the weekend getaway plans for camping, fishing, boating, hiking, etc. altering them to include an activity that would cause them to remember and reflect upon their own freedom and that for some American families, this particular holiday is but a painful reminder of the cost of freedom. An airman poses next to a wrecked American Sherman tank on the shore of Saipan in 1944. This tank remains in place, nearly 75 years later. When the guns fall silent and the now grizzled and weary combat veterans return home from war, time begins to erode the harsh realities the combatants lived and breathed on the field of battle. As the memories become distorted and faded, faces of those lost in combat are difficult to recall. Though, for many the scars never heal. The battle remains as vivid and crisp throughout the decades. But for the citizens who remained on the home-front, all is easily forgotten. On the now-silent battlefields of the world wars, reminders can still be found even as the surrounding environment engulfs and enshrouds them. 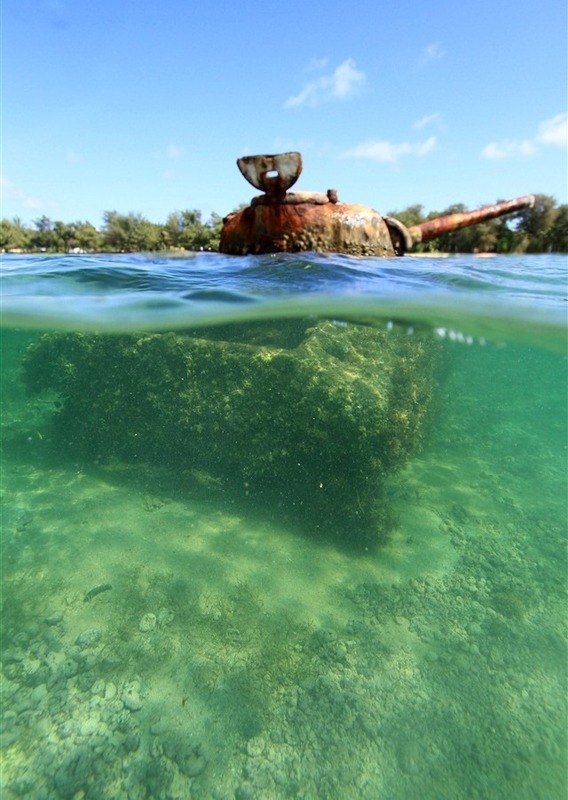 On land and in the surrounding waters of some South Pacific islands, visitors can still locate relics of war. Artillery shells and plane crash sites dot the landscape in places like Guadalcanal and Peleliu. Carcasses and hulks of tanks and AMTRACs (amphibious armored tracked vehicles or LVTs) remain partially or entirely submerged in the reefs of Saipan and Tarawa. But these are far from permanent or honoring remembrances. Throughout the many years and decades following the American Civil War, veterans were drawn, compelled by lingering painful memories, returning to the battlefields to retrace their bloody footprints and to reunite with others from their units who were following their own compulsions. By the early 1900s, full-blown reunions were happening in places like Gettysburg as once youthful, sworn enemies came together as aged friends. These old veterans, motivated by their efforts decades earlier, began raising funds with the idea to erect monuments and memorials to commemorate their units’ deeds and to remember those lost during the conflict. Today, there are countless monuments located at the various battlefield sites as well as spread throughout the nation, particularly within the participating states. The final resting place for the majority of the men who were killed at the Little Big Horn battlefield site is marked with this granite obelisk which contains the names of the men who are interred beneath it. As the United States has sent men (and women) off to war throughout the last century, the tradition of erecting memorials and monuments has continued both on foreign soil (with local consent and cooperation) and domestically. With the assistance of the military, the American Battle Monuments Commission, state and local governments, and various veteran service organizations, monuments have been erected in all fifty states as well as within several U.S. territories. I make a point of locating local monuments to remind myself that the statistics that are easily found on the internet are more than that to the people of their hometowns. Names etched in stone or cast in bronze are reminders of the very personal cost of war. Sons (and now daughters) who will never return home to their families and loved ones – their names are displayed that we will never forget. Some local monuments have national significance as they are symbols of the rally-cries – “Remember the Alamo!” “Remember the Arizona!” – that took us to war. In San Antonio, the Alamo mission is faithfully preserved. At Pearl Harbor, the Arizona Memorial sits astride the sunken ship, recalling the Day of Infamy. In my hometown, a small, nearly forgotten memorial stands as a reminder of war that most of my generation have no knowledge of. Placed more than a century ago, this monument is largely ignored by local citizenry though the artifact on display was taken from the wreck of one of the most recognizable ships in US history. This 10-inch naval gun projectile was recovered from the wreck of the USS Maine and placed here to serve as a reminder of those who were lost during the Spanish American War. In a local park, there stands a small pedestal holding a ten-inch naval gun shell that was removed from the sunken armored cruiser, USS Maine (ACR-1). The sinking of the ship was an impetus that vaulted the United States into a war with Spain, two months later (though the cataclysmic explosion that that destroyed the Maine remains a mystery that some experts believe could have been merely a crew-caused mishap or accident). The list of local service personnel who were lost during WWII. This monument is placed at War Memorial Park. A close up of the list of local war dead of WWII. This bell was recoverd from the wreck of the USS Tacoma CL-20) which was lost on Blanquilla Reef near Vera Cruz in January of 1924, killing her commanding officer and three radiomen. At my city’s War Memorial Park (interestingly, the Maine monument is not located here), a large bell hangs with the name of a navy ship and the date of which the ship was commissioned, cast into its face. Very few details are known about this ship, only that it was a protected cruiser and that it was lost when it became entrapped on a reef near Vera Cruz, Mexico, breaking apart in a heavy storm. The ship, named for this city, was commissioned in 1903 and served in World War I, ran aground lodging herself on a reef as it approached the port in 1924. Some suspect that the navigation aids marking the channel had been moved by Mexican revolutionaries. The commanding officer of the ship, Captain Herbert G. Sparrow, gave his life, refusing to leave the ship, hopeful that the USS Tacoma could be saved. Along with the captain, four radiomen lost their lives while the rest of the crew had been evacuated under the orders of the captain. Some collectors I know, spend lifetimes attempting to bring home the uniforms, medals and other militaria items as they assemble displays to honor their hometown heroes, utilizing the names etched on their local monuments. As you will note, the above list has nothing from the Korean or Vietnam wars as there are only a handful that exist throughout our country. As the planning for the Iraq and Afghanistan War memorial is planning and development (it was approved by Congress a few years ago), it seems that our nation is truly forgetting about those from the most recent conflicts and becoming increasingly indifferent towards service men and women and our veterans. Apathy and complacency becomes animosity and sadly our nation is already in the early stages of that transition. Viewing the original mooring quay that the USS Arizona was tied to (when she was attacked) from within the memorial. Collecting, preserving, researching and documenting military artifacts is another vehicle by which a small segment of the population honors those who served. This passion can serve to maintain the face of the veteran in conjunction with the sacrifice and service. Monuments and memorials provide communities with a focal point with which to assemble and remember the many generations of our fellow citizens who never returned home to their families. Memorial Day serving as a vehicle with which to re-center our citizens’ understanding of service and self-sacrifice and the very real cost of freedom. I emphatically encourage Americans (natural born, naturalized and would-be citizens) to embrace this nation’s history. One of the best ways with which to learn about the sacrifices that were made throughout our nation’s founding and preservation is to visit the monuments and memorials dedicated to those who gave their last full measure of devotion that we all would live and cherish our freedom. The USS Arizona Memorial is lighted at dusk with the USS Vincennes (CG-49) moored across the South Channel at Hotel Pier. Granted, Jefferson was referring to rebellion and revolution, however the sentiment applies to the restoration of freedom in foreign lands and the preservation of it for our own. The blood of patriots has been spilled since our nation was founded recommencing with the War of 1812 on through to present day. Standing on the hallowed battlefield grounds within our shores, once can gain a sense for the horrors of war an the sacrifices made by our great grandfathers, grandfathers, fathers, mothers, brothers, sisters, sons and daughters. This heritage belongs to all Americans, despite their nation of origin. Along with their freedom, they also inherit the history and legacy that is represented by the memorials and monuments found within our nation’s cemeteries, battlefields and public spaces, located domestically and abroad: American Battlefields and Monuments Commission: Cemeteries and Memorials. Civil War Battlefields Then and Now by James Campi Jr.
Today marks the 241st anniversary of the founding of the United States Navy. What better way to celebrate and honor the best branch of the U.S. armed forces than to discuss this service’s enlisted uniforms? In writing this blog, I am (happily and willingly) forced to expand my knowledge in a great many areas of military history that I otherwise would have overlooked. As I embark on a new article, I am presented with the opportunity to delve into learning about uniform details and nuances that I’d previously had little or no exposure to. One aspect of this post has finds me diving into uncharted territory (for me). On this posterior view, note the broadness of the blue flap and the horizontal blue piping along the seam of the jumper. The trousers have lacing at the rear of the waistband which is still in use on present-day dress blue trousers (source: James D. Julia Auctions). This Civil War-vintage dress white uniform was recently listed with an estimated sale price of $3,000-$8,000. Note the blue cuffs and the blue flap (white white stars), a design that would persist well into the 20th Century (source: James D. Julia Auctions). Another close-up view of the SpanAm jumper cuff shows the white button with an embossed anchor (eBay image). This close-up view of the Civil War uniform shows the hand-embroidered star on the collar flap’s corner (source: James D. Julia Auctions). The uniforms of the United States Navy, particularly the enlisted version, has maintained relative consistency in its design for more than 160 years. From the bell-bottom trousers and the collar flap to the various trim and appointments, today’s modern design has remained consistent with the original, functional aspects of those early uniforms. Leaning against a flag-draped table, this sailor’s uniform trouser-buttons are clearly visible and show the 7-button configuration (source: Library of Congress). This Civil War-vintage tin type photograph shows a sailor wearing his dress blue jumper, blue neckerchief, and flat hat (source: Library of Congress). Today’s jumper blouse design was incorporated with the collar flap which was used as a protective cover to protect it from the grease or powder normally worn by seamen to hold hair in place during the twenty years prior to the start of the Civil War. Piping and stars were added to the flap while the flat hat (affectionately referred to in the 20th century as the “Donald Duck hat”) became a standard uniform item during this period. In the late 1880s, the white hat (or “dixie cup”) was introduced, essentially solidifying the current configuration we see today. Prior to World War II, the blue cuffs were dropped from the white uniform and the flap was switched to all white with blue stars. By 1962, the flat hat was gone. A collector colleague steered me to an online auction listing for an absolutely stunning Civil War-era white (with blue trim) U.S. Navy cracker jack uniform. Constructed from linen, these white uniforms were hard pressed to survive the rigors of shipboard use, let alone 1.5 centuries. Examples such as these are extremely rare and carry considerable price tags. Continuing the same design elements of the Civil War toward the turn of the century, this Spanish-American War jumper has blue cuffs and a blue flap with the three-stripe piping and the single stars on the corner of the flap (source: eBay image). The rear of the Spanish-American War jumper shows the “sculpted” horizontal seam across the back (source: eBay image). A close-up of a SpanAm jumper shows the wool material and the three-stripe white piping (source: eBay image). 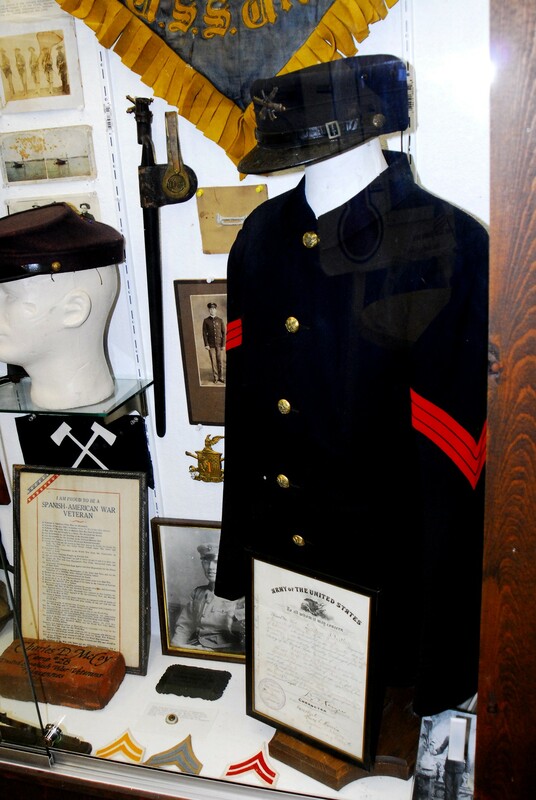 Since I’ve been collecting, I have seen a handful of late nineteenth century Navy uniforms listed at auction. While most of them are blue wool, I have seen a smattering of dress whites. With the arrival of the twentieth century, the Navy expanded its fleet and global reach requiring increase of manning. That expansion means that collectors today have greater opportunity (and to pay lower prices) to locate period examples. These later uniforms were constructed using better materials in order to perform better in the harsh, mechanized and considerably dirty shipboard climate. Blue uniforms were constructed from heavy wool while linen was dropped in favor of cotton-based canvas material for the whites. I have the privilege of owning this 1905-1913 coxswain dress white uniform. Note the blue wool cuffs and collar flap and the three-stripe white piping affixed. The flap also has two white stars directly embroidered to each corner. Today’s enlisted dress uniforms while representative of the pre-Civil War origins, they are quite sanitary and less desirable for collectors. Gone is the heavy wool for the dress blues. The dress whites are polyester, also called “certified navy twill” or CNT. One saving grace is that the white Dixie cup hats are virtually unchanged since their introduction, making them nearly non-distinguishable from early examples. Another jumper from my collection: this ship’s cook 2/c is from World War I and features a trimmed “crow” with the eagle facing to the left (rear of the sleeve). By World War II, dress whites no longer had the blue cuffs and a white flap replaced the blue one that had existed since the Civil War. With the exception of the heavy wool material (which has been supplanted by a light-weight weave), this World War II jumper does not differ from current-issue blues. When the Navy began to specialize the enlisted ranks in the late 1800s, special marks were incorporated to denote the skills of the enlisted sailors. This WWII aviation radioman 3/c uniform has the distinguishing mark of an aerial gunner on the right sleeve. Happy birthday to all of those who served before me and since my time in uniform. Happy birthday to my shipmates and happy birthday to the United States Navy! While there are certainly traditional military items that folks collect such as uniform items and weapons, some people aren’t satisfied with the status quo of militaria collecting. It takes a person with a bit of a twisted perspective to seek out the strange or odd items or to possess the ability to see the contextual vantage point of the militaria collector. Suppose that there are collectors who focus on field surgeon equipment from the Civil War era. A collection might include medicines and physician’s guides, but it could also include surgical implements. Aside from the traditional scalpel set, expect to see an array of macabre bone saws and tourniquets. Another example of what some folks might deem as odd militaria could be a collection of named (meaning, engraved with the veteran’s name) Purple Heart medals awarded to service members who were killed in action (KIA). While this may also seem dark, most collectors of Purple Hearts (at least that I’ve encountered) see this as a way to preserve history and share the story of those who made the ultimate sacrifice for our nation. Whenever I glimpse one of these medals, I am overwhelmed when I consider the price that was paid by an American. One of the most bizarre items of militaria that I have personally seen was at the Indiana Military Museum located in Vincennes, Indiana. Among the wonderful displays is a group of items that belonged to soldier who served during the 1898 war with Spain. It seems that he suffered a debilitating head wound when some stored ammunition exploded, emitting a destructive array of metal and wood debris. The result of the wounds sustained by Sergeant Gustave Baither was the traumatic loss of one of his eyes. Closer inspection of Blaither’s collection yields this odd gem – his glass eye. In my own collection, I have preserved an item that to the untrained eye would be indistinguishable as something pertaining to military use. However, this piece is a part of naval and seafarer tradition spanning centuries of sea-going service. Hand-made from a section of 1-1/2-inch fire hose, a piece of a broom handle, electrical heat-shrink tape and wrapped with braided shotline (used during Underway Replenishment), the shillelagh is a centerpiece of the equator crossing initiation ceremony known as Wog Day. This “Wog Dog Correction Tool”, also known as a “Shillelagh, ” was made and used aboard the USS Camden (AOE-2) during the 1989 WestPac deployment. My shillelagh, made during my last sea deployment in 1989, was used to provide much-needed correction to the pollywogs (those who hadn’t crossed the equator) by applying gentle (ok… maybe not-so-gentle) swats to their posterior region as they crawl across the ship’s decks. Upon completion of that cruise, my shillelagh was tossed into my closet where it has remained, almost forgotten… that is until my kids wanted to learn about Navy traditions. What unusual items are in your collections?